Keith Ferrazzi, the author of Never Eat Alone and a world-renowned expert in social and professional networking, claims he has more than 10,000 people he can call on to provide him with their services when needed. Unsurprisingly, he believes that success is only achieved by building relevant relationships and using them in a way that makes everyone feel like a winner. His strategy is based on the ideas of generosity and authenticity: agree to be helped but also help those around you when they’re in need. According to Ferrazzi, in both your personal and professional life, being invisible is worse than failing. He sees success as a simple equation that depends on the people you meet and what you decide to build and develop with them. 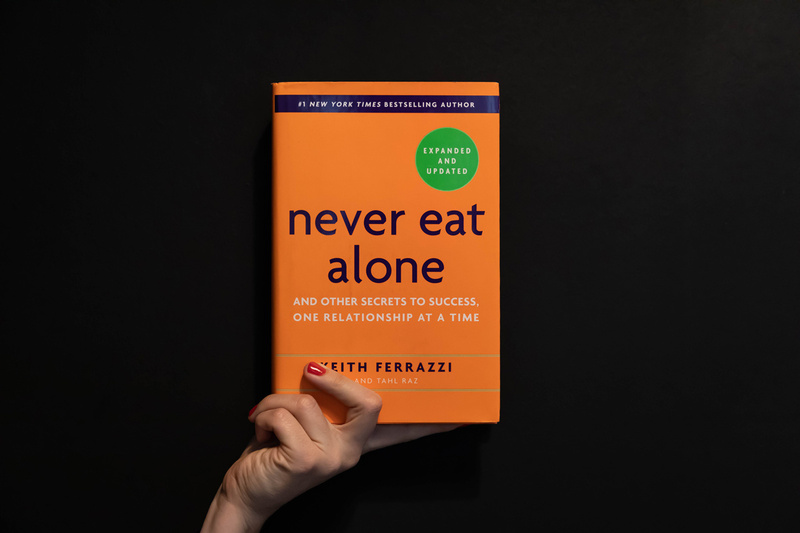 In Never Eat Alone, Ferrazzi questions why some people are able to quickly connect with others and have endless lunches with potential partners or investors, while others don’t seem to manage it. He explains that, over time, he realized that the secret to networking is the desire to help others succeed and to always give more than you get. He believes this is the best way to take advantage of situations and opportunities that you could end up missing out on if you only think about your own interests. Building a network means learning about yourself, about others, and about their business, as well as rejoicing at others’ success and seeing them rejoice at yours. It is about bringing added value and playing the role of a networker. If you are to achieve this goal, Ferrazzi emphasizes that it is essential to do away with using intimidation or manipulation in your relationships with others. Everyone likes to feel important, and that’s how your contacts should feel, too. Ferrazzi underscores the importance of loyalty when it comes to developing long-term relationships, as well as the need to adopt a psychological approach: sometimes your contact may just need emotional support. And if you’re not able to provide this yourself, the best thing to do is to introduce them to someone in your network who has been through a similar situation. Adam Grant, a bestselling author and professor at Pennsylvania University’s Wharton School, is mentioned in the book as having demonstrated that the success of those who are generous with others usually has a positive knock-on effect, making them more productive. It is therefore important to ensure that people are keen to work and interact with you. Here are some pointers for creating a virtuous circle. In his book, Ferrazzi shares his smart approach and key tips for developing your own network. Firstly, it’s important to learn about the people you’re hoping to work with from both a professional and personal point of view: what do they do in their free time, what are their goals, what are their greatest successes? To find this out, don’t hesitate to use social networks—Google, LinkedIn and Twitter are your friends, as are the annual reports of the company where the person works. The idea is to find out in advance what challenges the person is facing, what their needs are and what their expectations are when meeting you. Of course, this may seem time-consuming, but having a small but detailed look at the lives of the people you’re due to have a meeting with is what Ferrazzi calls “doing your homework.” He then explains how to transform words into action by turning this new knowledge into long-term relationships: distinguish between the people who can help you achieve what you want and those for whom you can provide a service. He also explains how to take the initiative and motivate people without appearing to being doing so and, above all, how to never eat alone! Ferrazzi also pragmatically outlines a strategy for how to maintain your network in an interconnected world where everything moves fast. Today, there are numerous lines of communication that could be used, and he recommends adapting to the wishes of the person you’re interacting with. If they say emails quickly get buried in their inbox because it’s full of unread messages, prioritize phone calls. Likewise, if your contact says they don’t have time to talk on the phone, put together a message that will not go unnoticed. Pay attention to the subject of your message. To avoid the risk of your email going unread, Ferrazzi recommends finding something that sparks the recipient’s curiosity. Timing. According to Ferrazzi, you should prioritize making contact in the morning, at lunchtime, or in the final hours of the workday. Be concise. To avoid losing the interest of the recipient, it’s best to ensure your message is to the point and sets out what’s expected from them without being too wordy. Read your message out loud before sending. This is the best way to make sure that your message is clear and has the tone of a verbal conversation. According to Ferrazzi, you should also ensure that it does not take longer than 45 seconds to read. Spelling. It goes without saying, but there is zero tolerance about spelling things incorrectly when it comes to sending a message. Never Eat Alone is a book that’s full of anecdotes and advice about creating and maintaining a network of people you can count on in times of success and failure. The book encourages us to diversify our meetings, leave our comfort zone and create opportunities that wouldn’t otherwise present themselves. In a nutshell, Ferrazzi is a true expert on the subject of networking and invites us to focus on what is called “the strength of weak ties” in sociology. Inspired by the philosophy of his book, a young Frenchwoman originally used Never Eat Alone as the name for an app she created to encourage networking between large groups of workers at lunchtime. What about you—do you need a helping hand to expand your network?